In the midst of the sorting and throwing out and giving away–my kids uncovered an old sketchbook of mine from 7th grade. It was one of the things required for a summer talented and gifted camp that I went to the summer after my 7th grade year. I like to add emphasis to the talented and gifted part, because as you keep reading this, you’ll realize I need to remind my kids that yes, at one point, I did qualify for that camp, despite what’s written in this sketchbook. The camp was spent on the eastern shore of Maryland and was put on by the Chesapeake Bay Foundation. It was a 3-week long camp full of adventures like marsh-mucking, canoeing, camping out and late-night hiking without flashlights. We lived in tents. We were dirty. And we were all about saving the world. I remember I didn’t make it through all three weeks of the camp. I got “sick” halfway through. Though I’m pretty sure I was instantly healed as we were pulling out of the parking lot and on our way back home. Funny how that happens. But 7th grade must have been the year of the poem for me. My sketchbook is full of sketches of the earth–crying–and poems I was writing to save the planet. My oldest child is also a bit of a poet. So when I just so happened to uncover my 7th grade poems, I thought we needed to have a bit of a poetry slam fest in the kitchen after dinner Sunday night. We each read our poems aloud to the family, and Dan was the judge. 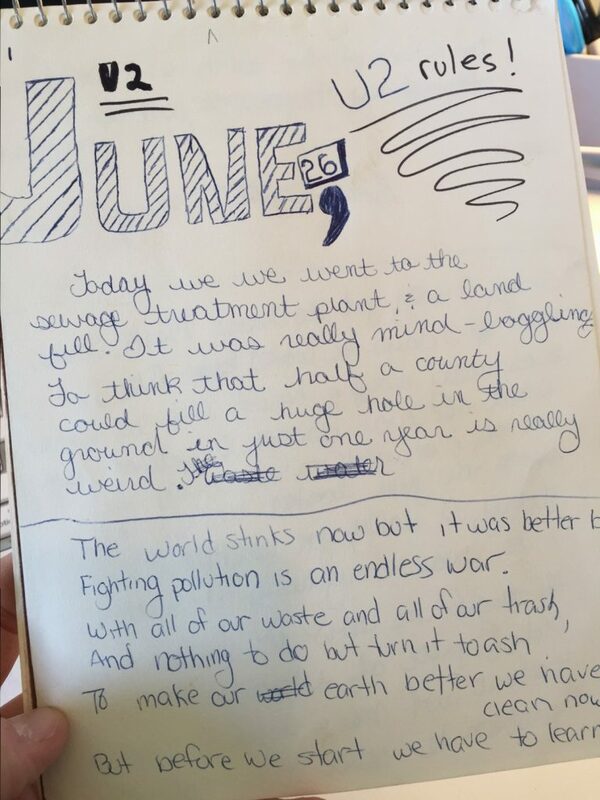 To set the scene for my poem…it was written on June 26th, which according to my journal entry was also the day we visited a waste water treatment plant. (For the record, this day was the beginning of my LIFE-LONG fascination with waste water treatments plants. I’ve always wanted to take my kids on a tour. Seriously. I love them. I know, I’m strange.) Also, at the top of my paper in huge letters : U2 RULES. fighting pollution is an endless war. We must try to preserve our beautiful homeland. Emma’s post was written early this school year when her class went to outdoor school. Part of the time was spent on the beaches of the Chesapeake Bay (in the freezing cold rain) building shelters. Emma has another poem she wrote a few days ago that blows me away, I’ll ask her first but might share it here tomorrow. In the meantime, since this poem also involved the bay, and was one of the few she writes that rhymes, it’s seemed like a fair match up. if only it was hotter! jumping like monkeys in the bay. back into the foam of the frosty water. building with a new kind of mold. dancing to it’s own music like bees in a hive. It had a mind of its own and no one to control it. dancing around in the bay. and suddenly it didn’t seem so dim. followed me all the way. Do your kids write poetry? I’d love to hear!